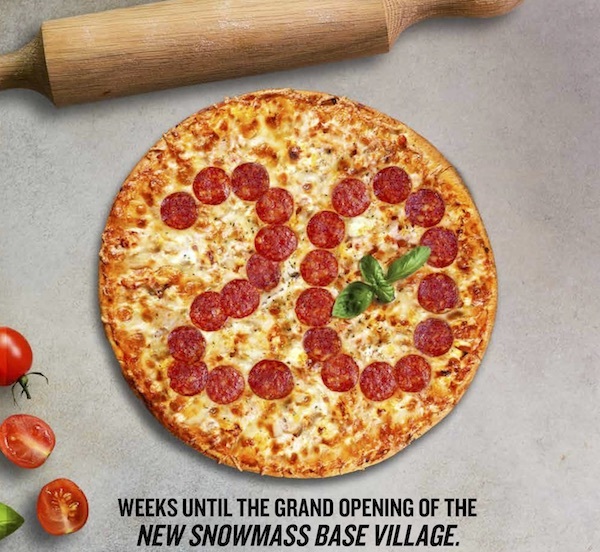 We’re just 20 weeks away from the grand opening of the new Snowmass Base Village and we couldn’t be more excited because, soon, the new Limelight Snowmass Lounge’s famous pizzas will be available for all to enjoy! Are your stomachs growling, yet? When the Limelight Lounge opens this winter it’s sure to become the center of après action in our new Base Village. Welcoming locals and guests alike, everyone will savor the local brews, signature cocktails and Italian comfort cuisine, including the famous pizzas from the wood-burning pizza oven. Live entertainment will also be featured from local and touring musicians and bands. Sunny ski days and beautiful summer afternoons and evenings will have people spilling onto the Lounge’s outdoor patio, the perfect spot for watching and enjoying all the action on the plaza’s ice skating rink and five-story climbing wall! When the Limelight Snowmass opens this winter it will include 99-guest rooms and 11 whole ownership residences. It’ll feature the same laid-back luxury that made the Limelight Hotels in Aspen, Colorado and Ketchum, Idaho famous (with a dash of family-centric fun to make it uniquely Snowmass). Visit us today at our Sales Experience in Snowmass Base Village, call us at 970-924-9100 or email us at info@allinsnowmass.com and we’ll take you on a tour.